Todd Kliman is a James Beard Award-winning columnist and restaurant critic, awarded in 2005 for his column in The Washington City Paper with published works in The New Yorker, National Geographic Traveler, and Harper's among others. His first book, The Wild Vine, garnered much praise with its unique character-driven perspective of the history of wine during the nineteenth century. 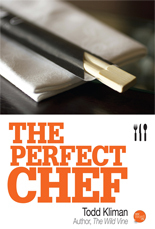 Now, Kliman has published his second book titled The Perfect Chef, the story of Kliman's introduction to and fascination with Peter Chang, an award-winning Szechwan chef. It's written from the perspective of a restaurant critic that becomes intertwined with both the food and personal story of his subject, leading to a journalistic obsession. In his professional career, Chang has been known for establishing popular restaurants, yet leaving them frequently and often disappearing without a trace. Kliman's investigation attempts to fill in the gaps. The Perfect Chef is "a fascinating, funny, page-turning tale of food and memory, of lust and betrayal," according to the official PR release. It's currently available as a downloadable Ebook, published May 1, 2011 by New Word City, Inc.